News in brief: Early last night on Friday 19th September at around 2000 hours, Race Management was alerted by Matthieu Girolet, skipper of Entreprendre Lafont Presse, that there didn’t seem to be any sign of life aboard the boat SIRMA. Christian Gout and his men immediately tried to contact Christophe Bouvet but to no avail… A rescue party was rapidly put together and the closest competitors were diverted. Little by little the whole fleet was searching for Christophe. This solidarity paid off in the end since Christophe Bouvet was recuperated two hours later by Paul Meilhat. Stage 2 Cagliari (Sardinia) / Marzamémi (Sicily) has been rendered null and void and its start moved forward to later in the day. The time of the next start will be set at 1400 hours following the competitors briefing. You must always respect the philosopher Pascal’s wager, which said that even though there’s a chance in a million of success, you have to attempt this chance. 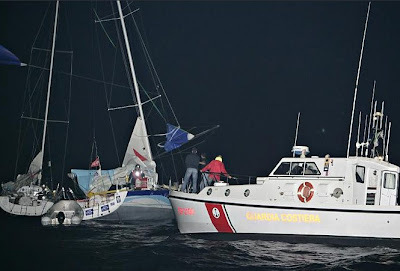 Christophe Bouvet, fell overboard in a particularly violent squall, and was fished out a little more than two hours later by Paul Meilhat, one of the race competitors who was diverted to go in search of him. The rescue came about thanks to a fine chain of solidarity. “Race Management from Entreprendre Laffont Presse”, the voice of Mathieu Girolet has real note of concern in it. 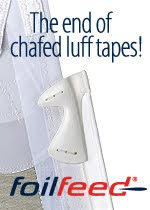 The fleet, which was hurtling along nicely under spinnaker, was suddenly hit by a nasty squall with peaks of over 45 knots of wind. Mathieu had just passed alongside SIRMA, Christophe Bouvet’s boat. The yacht was all over the place and there was no sign of life aboard. Immediately Christian Goût tried to contact Christophe, without response… Even though nobody wanted to say it, there wasn’t a second to lose. The closest boats were immediately diverted towards the position of Christophe’s boat. 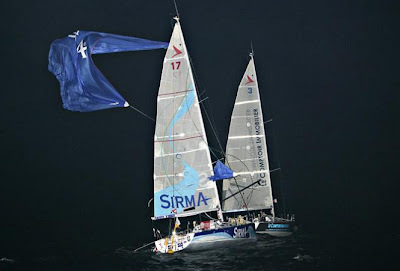 Jeanne Grégoire, Gildas Mahé, Mathieu Girolet, Paul Meilhat headed towards the position of Sirma, identified by its VHF. The emergency services were alerted and the Cagliari coastguards began to set a distress plan in motion. Faced with the gravity of the situation, the racers spontaneously decided, one after the other, to retire from the race and make headway under motor towards Christophe’s position. Mathieu Girolet who was first to get there confirmed the news; the boat was drifting with all sails aloft and nobody on deck. Night fell and everyone converged on the zone. Whilst the first boats in the area began their search upwind of Sirma’s position, race management arrived on site. Philippe Chapel boarded the catamaran’s tender and climbed aboard Christophe’s boat. There was nobody there. Gérald Véniard, boosted by his perfect control of the navigation tools, took the initiative: we can reconstitute the memory of Christophe’s course on Sirma’s tracker. With advice from Gildas Mahé who had remained close by, Philippe Chapel was then quickly able to give the estimated position of Christophe’s fall to the whole fleet via VHF. The wait is interminable. In their new roles as rescuers the competitors travel the length and breadth of the zone, turning on their lights in the ink black night. At the request of race management, several distress flairs are fired to light up the zone and indicate to Christophe that there is a search underway. Despite their concern, the racers stay calm. The minutes tick by.